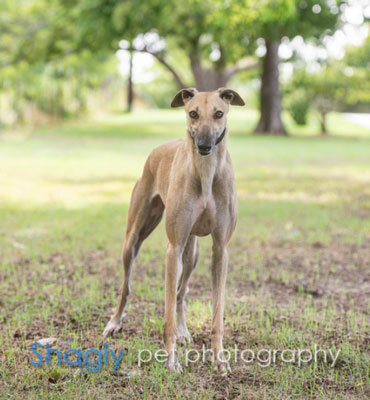 Olivia is a beautiful 1 1/2 year old fawn female born December 17, 2016. Her sire is Flying Coal City, and her dam is Atascocita Genie. Olivia was not individually registered as she showed no promise as a racer. She is the "B" pup in the litter, with her sister Riley being the "A" pup and her brother Rush being the "C" pup - they are kinda like triplets! It is not known at this time if Olivia is small animal or cat tolerant. 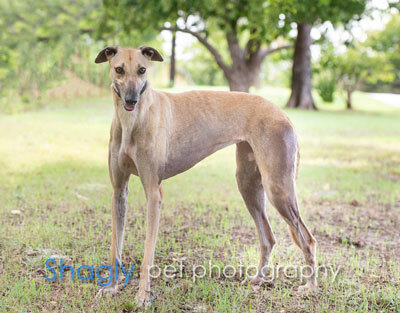 Miss Olivia is a beautiful young lady who’ very loving and affectionate. You can see the playful side of her in the mornings and in the evenings - those long legs come marching in and toys might be tossed in the air with a mini zoomies following! Also running outside is one of her favorite things to do, I’ve counted 9 rounds around the pool and then she’s done. Olivia’s living in a household with 2 non-greyhound dogs and gets along very well with both. She’s more subtle in her way of playing and tug of war for example makes her shake her pretty head and goes back to her bed while the other 2 pull a toy from both ends, Olivia doesn’t see any point doing that. What she enjoys is tossing the toys in the air outside and running with them around the pool. She doesn’t mind at all if a 50% slower non-greyhound dog tries to keep up, mostly this game causes laughter on people watching it. , She walks beautifully on a leash and loves to explore the streets and parks. Her pointers (that’s what I’ve started to call her ears) go left to right when we walk, and you don’t want to take directions on those as they keep changing directions several times and can get you lost. Other dogs and people on the street make her long tail wag and most of my neighbors can’t resist coming to pet her and tell me how pretty and sweet this girl is! , In the evenings especially, you’ll start experiencing the loving and affectionate Olivia (though you can’t miss that at any point of the day). She loves her head to be rubbed and if you’re watching TV she’ll come stand next to you and gives a little kiss meaning “please rub my head”! She’s a sweetheart that follows you in the house and likes to be close to you. Olivia will look at you with those beautiful eyes and your heart just melts and you realize once again you’re walking towards her to give her love. You cannot avoid falling in love with her.